The plane tilts and slants through the clouds. Suddenly, there below, is an expanse of sunlit sea, a crowded launch trailed by threads of wake, a yacht in full sail, a rough circle of land with a sprinkling of buildings half-hidden in dark green bush, a forest of tall masts at a marina, a stretch of sandy beach and way out in the distant blue, the broad white line of the reef. From up here, Hamilton Island looks like Paradise. Down on the ground, the sun is warm, the air is soft and it feels like Paradise. Until 1975, when it was purchased by “men with vision” Keith Williams and Bryan Byrt, Hamilton Island remained just a bush covered dot in the ocean. 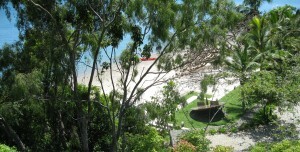 In 1978 Keith Williams commenced construction of Hamilton Island Harbour. Work on the Hamilton Island Resort began shortly after and in 1982, it welcomed its first guests. In 1986 the Whitsunday Holiday Apartments opened, followed by the Reefview Hotel in 1990 and the five star Beach Club in 1999. In 2003 the Oatley family acquired the resort. Among the Oatley developments are the Yacht Club with its fabulous restaurant. Then, there’s qualia.